This game casts you as the healer standing behind the tank who takes on wave after wave of enemies. Spend your slowly-regenerating mana, items dropped by enemies, and level-up skill points in order to keep the tank alive for as long as possible. You will eventually fall, and the goal is to get farther next time. As such, the gameplay has elements of roguelikes, tower defence, and resource management puzzles. There’s not a lot of polish - the interface is pretty bad, the small amount of dialog is poorly translated, and it doesn’t take long to exhaust the game’s depth - but it’s a neat concept presented with surprisingly engaging atmosphere and gameplay. 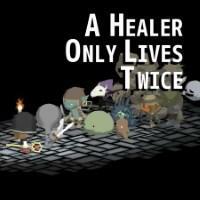 There aren’t many single-player games that cast you as the healer; I’d like to see more. I Stopped Playing When: After a few runs, I felt like I’d seen all there was to see and the experience wasn’t polished or exciting enough for me to want to put more time into it.